The greatest stories ever told. There's hardly anyone in the world more down to earth than Jesus. That sounds far-fetched because ......well, Jesus is God. But read the Gospels and you find Jesus telling stories that ring true from beginning to end, stories you can immediately identify with, stories that make you go hmmm. The parables of Jesus meet us as we are, but don't leave us as we are. 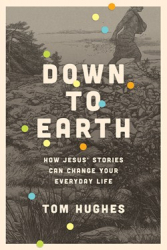 In Down to Earth we learn that Jesus' stories are meant to be lived into. When you do, you and the world around you are transformed for good.